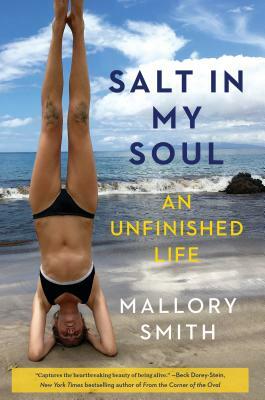 Diagnosed with cystic fibrosis at the age of three, Mallory Smith grew up to be a determined, talented young woman who inspired others even as she privately raged against her illness. Despite the daily challenges of endless medical treatments and a deep understanding that she’d never lead a normal life, Mallory was determined to “Live Happy,” a mantra she followed until her death. Mallory worked hard to make the most out of the limited time she had, graduating Phi Beta Kappa from Stanford University, becoming a cystic fibrosis advocate well known in the CF community, and embarking on a career as a professional writer. Along the way, she cultivated countless intimate friendships and ultimately found love. What emerges is a powerful and inspiring portrait of a brave young woman and blossoming writer who did not allow herself to be defined by disease. Her words offer comfort and hope to readers, even as she herself was facing death. Salt in My Soul is a beautifully crafted, intimate, and poignant tribute to a short life well lived—and a call for all of us to embrace our own lives as fully as possible. Mallory Smith, who grew up in Los Angeles, was a freelance writer and editor specializing in environmental issues, social justice, and healthcare-related communications. She graduated Phi Beta Kappa from Stanford University and worked as a senior producer at Green Grid Radio, an environmental storytelling radio show and podcast. Her radio work was featured on KCRW, National Radio Project, and State of the Human. She was a fierce advocate for those who suffered from cystic fibrosis, launching the viral social media campaign Lunges4Lungs with friends and raising over $5 million with her parents for CF research through the annual Mallory’s Garden event. She died at the age of twenty-five on November 15, 2017, two months after receiving a double-lung transplant. Mallory’s Legacy Fund has been established in her memory at the Cystic Fibrosis Foundation.